Lightning is the most dangerous and frequently encountered weather hazard that physically active people face each year. According to Orville and Huffines research (2001), there are approximately 25 million cloud-to-ground lightning strikes in the United States each year, resulting in nearly 100 deaths and an additional 500 injuries. While it appears that the number of overall deaths from lightning strikes is decreasing, trends show that the number of injuries continues to rise. And lightning casualties during sports and recreational activities have risen alarmingly. Most lightning-related injuries occur between May and September, and nearly 80 percent occur between 10 a.m. to 7 p.m. Check the weather forecast before you head outside and be aware of any storms in your area or conditions that are right for the development of thunderstorms. If thunderstorms develop, count the seconds between the flash of lightning and the bang of the thunder to estimate the distance between you and the lightning strike. Because sound travels at approximately 1 mile in 5 seconds, you can determine how far away the lightning is by using this "flash-to-bang" method. It is recommended that you seek shelter if the time between the lightning flash and the rumble of thunder is 30 seconds or less (6 miles). Once inside shelter, you should not resume activities until 30 minutes after the last audible thunder. This is known as the 30/30 Lightning Rule. Keep in mind that although uncommon, lightning has been reported to strike up to 10 miles or more from where it is raining. Blue skies overhead do not guarantee protection from lightning strikes. Lightning can strike far from where it is raining. Check the forecast and watch the sky. Darkening skies, flashes of lightning, or increasing winds may indicate an approaching storm. Count seconds between 'flash' and 'bang' and seek shelter when the time is less than 30 seconds. Sturdy buildings are the safest place to be during lightning storms. Avoid sheds, picnic shelters, baseball dugouts, and bleachers. Staying in a car with windows closed also offers some protection. Avoid isolated trees or other tall objects. It's better to seek shelter under a thick growth of relatively small trees. Don't wait for rain to seek shelter. Get out of the water. Water is a great conductor of electricity. Avoid any metal objects such as bicycles and golf clubs, fishing rods, tennis rackets or tools. Never lie flat on the ground during a lightning storm. If on a bicycle and lightning is within 5 miles, STOP riding, get off of your bicycle, find a ditch or other low spot and sit down. 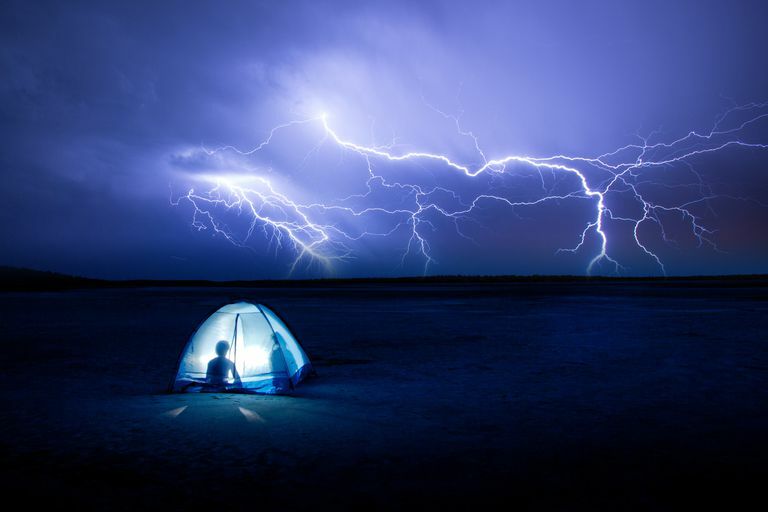 If you are caught in a lightning storm and if you feel your hair stand on end, your skin tingle, or you hear crackling noises, crouch on the ground with your weight on the balls of the feet, your feet together, your head lowered and ears covered. Some experts recommend placing your hands on your forehead and your elbows on your knees to create a path for lightning to travel to the ground through your extremities rather than through your core (heart). According to the Colorado Lightning Resource Center, there is no safe place in the mountains during lightning. They advise hikers to be heading down from the mountain peaks by 11 a.m. because most mountain storms occur in the afternoon. If you are caught in an approaching storm, quickly get below tree line and get into a grove of small trees. In the mountains, there are accounts of people being injured and killed while hiding in caves, under rocks, in tents, and under trees. If caught in the open while hiking in the high country it's best to get in the lightning-safe position and wait the storm out. Call 9-1-1 or your local ambulance service. Get medical attention as quickly as possible. If the victim has stopped breathing, begin rescue breathing. If the heart has stopped beating, a trained person should give CPR. If the person has a pulse and is breathing, address any other injuries. Check for burns in two places. The injured person has received an electric shock and may be burned, both where they were struck and where the electricity left their body. Being struck by lightning can also cause nervous system damage, broken bones, and loss of hearing or eyesight. People struck by lightning carry no electrical charge and can not shock other people. Decision Tree for Personal Lightning Safety by Richard Kithil, President &CEO, NLSI, The National Lightning Safety Institute. Lightning Strikes: How to Lower Your Risk. Michael Cherington, MD; Philip R. Yarnell, MD with James R. Wappes. The Physician and Sports Medicine - VOL 25 - NO. 5 - MAY 97. NOAA Lightning Safety, NOAA, National Weather Service.